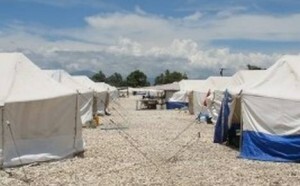 PORT AU PRINCE - Since the 2010 earthquake in Haiti, the number of humanitarian organizations working in the country has been reduced drastically, while 37,967 displaced people are still living in 27 camps in Haiti despite the efforts of the Haitian government and the international community to assist and relocate 97 percent of the displaced population. Since 2010, 1,528 camps have been closed and more than 1.5 million people have been relocated with the support of several international donors, HaitiLibre reported. Around 2,900 people (1,862 adults, 315 children under four years of age and 723 between 5 and 18 years old) displaced by the 2010 earthquake, are still living in Camp Tabarre, which was intended to accommodate displaced persons for only three years. Fred Standley Vincent, from the International Organization for Migration (IOM) Camp Management Operations (CMO) team, who regularly visits the camp, said "the biggest challenge we face is to calm down the frustrations," noting that "IOM is the last humanitarian actor that accompanies this camp and the population has many expectations, which is normal." For more than seven years, the population has been able to build a certain neighbourhood life; one finds there a barber, small shops, as well as two nursery and primary schools. Seven years old is also the age of a little boy who has never lived elsewhere than in a camp, like 315 other children under the age of four years in this camp. More than seven years later, a final effort could put an end to the displacement of these families by relocating or integrating the remaining camps in the original neighbourhoods where IOM now relies only on the Canadian government as the only one donor in its relocation activities in the metropolitan region.